Days before Donald Trump is due to rip up the JCPOA, Israeli Prime Minister Benjamin Netanyahu used cartoonish props to accuse Iran of hiding nuclear weapons. Journalist Max Blumenthal says that this is part of Israel’s strategy to escalate aggression against Tehran. BEN NORTON: It’s the Real News. I’m Ben Norton.Israel’s extreme right-wing Prime Minister Benjamin Netanyahu has launched a last-ditch effort to try to kill the Iran nuclear deal. 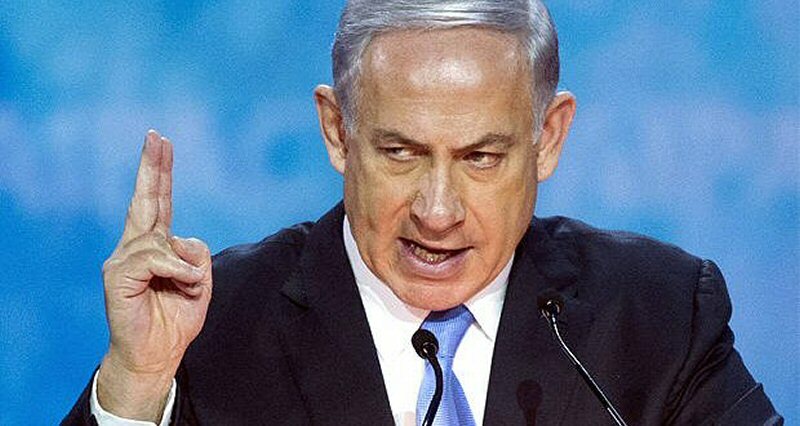 In a strange speech on Monday, April 30, Netanyahu used a PowerPoint presentation and stage props, and accused the Iranian government of supposedly hiding its nuclear weapons program. BENJAMIN NETANYAHU: Iran lied. After signing the nuclear deal in 2015, Iran intensified its efforts to hide its secret nuclear file. In 2017, Iran moved its nuclear weapons files to a highly secret location in Tehran. A few weeks ago, in a great intelligence achievement, Israel obtained half a ton of the material inside these walls. And here’s what we got. 55000 pages, another 55000 files on 183 CDs. BEN NORTON: Scientific experts have called into question Netanyahu’s claims, saying that what the Israeli prime minister revealed was actually not new information, that it’s in fact a decade old, that it was already known, and that he’s misrepresenting it. Netanyahu’s political motivation behind this political stunt was very clear. He strongly implied that U.S. President Donald Trump should tear up the Iran nuclear deal that was agreed to under President Obama in 2015. BENJAMIN NETANYAHU: So these files conclusively prove that Iran is brazenly lying when it says it never had a nuclear weapons program. The files prove that. So this is a terrible deal. It should never have been concluded. And in a few days’ time, President Trump will decide, will make his decision, what to do with the nuclear deal. I’m sure he’ll do the right thing. The right thing for the United States, the right thing for Israel, and the right thing for the peace of the world. BEN NORTON: On May 12, Trump will announce whether or not he will sabotage the international agreement, which is known as the Joint Comprehensive Plan of Action, or JCP O A. Iran’s Foreign Minister Javad Zarif responded sarcastically to Netanyahu’s speech. He tweeted a photo of the cartoon bomb the Israeli prime minister used in a past speech at the United Nations, and Zarif wrote, quote: “The boy who can’t stop crying wolf is at it again, undeterred by cartoon fiasco at U.N. GA. You can only fool some of the people some of the time.”.Joining us to discuss this is Max Blumenthal. Max is an award-winning journalist and the author of several books, including his forthcoming book, “The Management of Savagery,” which will be published later this year. Max is also the founder and editor of the independent investigative journalism initiative the Grayzone Project, which can be found at GrayzoneProject.com. Thanks for joining us, Max. BEN NORTON: So, Max, can you respond to this? Clearly Netanyahu has a history of using, you know, kind of cartoon props to make these extreme accusations. What is your take? MAX BLUMENTHAL: Yeah, he gets more props and stunts than Bruce Willis. As Gang Starr might have said. I mean, this is the most theatrical world leader that we have ever known in any form, and to some extent his props have been effective. I think his prop at the UN on the Iranian Red Line was somewhat effective. But there is a different, there was a different administration in Washington which saw the JCPOA, or the Iran deal, as more beneficial to America’s role in the Middle East, and saw Iran as an honest partner that it, you know, would actually maintain the deal. That’s borne out in IAEA assessments. The most recent one was on March 5, and it found that Iran was in full compliance of the JCP O A, the nuclear deal. The State Department, even under Trump, has found that Iran is in full compliance.But basically, Donald Trump, who campaigned against the Iran deal, partly thanks to enormous amounts of funding, over $40 million of it from Sheldon Adelson, Paul Singer, and other pro-Israel billionaires, has declared that he will exit the Iran deal. That could happen as soon as this month. He surrounded himself with anti-Iran hardliners like John Bolton and Mike Pompeo. And Trump has an agenda. And what Netanyahu did with his props and stunts was designed solely to give Donald Trump space to exit the JCPOA. That’s why he delivered the speech in English. It was not for the Israeli public. That’s why he had the props and the screen behind him. It was for American consumption, it was for the Fox News audience, and it was to somehow implant in the minds of the American mainstream media that there was an intelligence case to be made that Iran had a secret nuclear program, and that it was deceiving the world.This is absolutely absurd. And the night before Netanyahu’s presentation, Israel attacked the T4 base near Homs in Syria, killing as many as 23 Iranian military figures, including, possibly, a top officer. You know, Iranian soldiers who are in Syria to stabilize the state against this regime change war which has been running for seven years. That was the precursor to Netanyahu’s speech, and the point was to alert the world to the fact that Iran is in Syria, that they supposedly have these regional imperial ambitions. But beyond that, we actually saw Dror Michman at the Brookings Institute, who is an adviser to Netanyahu, admit earlier in April that the April 9 Israeli strike on the T4 base in Homs was designed to provoke an Iranian response.So you actually see evidence on the ground of Netanyahu trying to stoke the flames of a regional war against Iran, while providing Trump with the space through these theatrical presentations to exit the Iran deal and intensify friction and brinksmanship with Iran. It’s a really dangerous scenario, and actually I did an interview with you guys, with Paul Jay, as Trump was coming in. And I cast doubt on the idea that this would ever be possible, or that the U.S. would exit the Iran deal. And I’m kind of shocked at how rapidly Trump has moved on this, on this front.BEN NORTON: Well, there are a few things to unpack there. One, I do definitely want to mention the Syria angle. We know that Israel has launched at least 100 airstrikes against Syrian, Iranian, and Hezbollah targets inside Syrian territory, often violating Lebanese airspace in order to do so. Before we get back to that, the Iran nuclear deal, what’s interesting about this, and it’s something that I don’t see mentioned a lot in Western media outlets, especially American media outlets, is that this is an agreement that was not only signed by the U.S. and Iran, it was also the five permanent members of the Security Council. So that’s not just the U.S., but also France, the UK, Russia, and China. And in addition, Germany also signed it, the P5 plus one. We’ve seen that all of the other signatories, including China, Russia, the UK, France, and Germany, they want the agreement to continue. It’s actually just the U.S. that wants to destroy this deal, specifically Donald Trump. So can you respond to what this says about, you know, this discussion of rogue states in the world? We hear Syria is a rogue state, Iran is a rogue state. Well, they’re the ones who are actually abiding by the agreement, and the U.S. is the one trying to sabotage it. MAX BLUMENTHAL: Yeah, absolutely. I mean, we always lose sight of the fact that this deal is so important to Europe, which conducts a lot of trade with Iran. Emmanuel Macron, the French president, was just in Washington to kind of lecture Trump on the need to maintain the Iran deal. And Angela Merkel certainly feels the same. Germany does an enormous amount of trade with Iran. This is also coming as Trump is threatening a trade war with the EU. So what we’re seeing is a neoconservative interpretation of the America First agenda, where the U.S. intends to go it alone, but in an aggressive and bellicose manner, striking at one of the countries that has refused to comply, and which Israel has put at the top of its target board.We need to look really closely at Netanyahu’s presentation, though, understand how shabby it was. He referred to project Amad, and he did appear to have authentic files, by all accounts, of a project that was initiated by Iran right after George W. Bush introduced the concept of the Axis of Evil. So we can thank David Frum, the new Resistance hero, for this. And what it appears to be is a kind of breakout project that would’ve allowed, potentially, Iran to carry out nuclear tests in an emergency situation if they were facing an invasion, or some kind of attack. What it called for was such a tiny arsenal that, in the words of a Defense One columnist, not exactly, you know, wild-eyed leftist anti-imperialist today, it would have made Kim Jong-un giggle. I mean, it just dwarfed in comparison to North Korea’s modest nuclear arsenal. It was closest, maybe, to apartheid South Africa’s program, which was to produce just a few warheads, just in case they felt an existential threat.But the program lasted for a few months, it appears, never went anywhere, and that was the end of it. After that little attempt at some kind of breakout project, Iran did not appear to have any active nuclear program. And once again, that’s been affirmed by the IAEA and the U.S. State Department. So what Netanyahu revealed was almost nothing. But what he intended to do was to generate sort of an information war, to stir up an information war to push the U.S. into a real war.And it’s also interesting for me to witness the skepticism of a lot of liberal pundits, some of the foreign policy pundits who supported Obama’s foreign policy, particularly the Iran deal, and how these same pundits, I’m thinking about the Intercept’s Robert Mackey or Peter Beinart at the Atlantic, have attacked skeptics of the Russiagate narrative, or skeptics of the Syrian opposition’s narrative on the supposed chemical attacks in Douma. It seems like these figures, and their skepticism, is limited to the kind of political parameters that were laid out by the Democratic Party. So there’s a certain irony there, but I really think there’s going to be enormous opposition in Washington if Trump does try to exit the JCPOA, not just because of how it will intensify friction with Iran, but because of how it will damage already withering relations with European allies. BEN NORTON: Well, unfortunately we’ll have to end it there, but we will, here at the Real News, we’ll have Max back soon to discuss Israel’s role in Syria and how this Israel war, indirect war, on Iran is being waged there. But thanks for sharing your analysis with us, Max. MAX BLUMENTHAL: Thanks a lot. BEN NORTON: We were with Max Blumenthal, who is an award-winning journalist and the author of several books. He’s also the editor of the Grayzone Project, which you can find at GrayzoneProject.com. Reporting for The Real News, I’m Ben Norton.